This luxurious leather formula combines our cleaning, conditioning and leather protection formulas to safely and conveniently clean, moisturise and protect your fine leather. 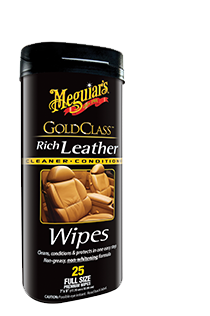 Our super luxurious textured wipe material is saturated with high levels of rich moisturisers, including aloe, to pamper your fine leather while protecting from spills, stains and UV damage. HOW TO USE: Pull wipe from canister and wipe onto leather surfaces. Keep turning the wipe to clean side for best results. NOTE: Not for use on suede. *ALWAYS READ FULL DIRECTIONS PRINTED ON THE PRODUCT PRIOR TO USE.